Spotted this at the local IH Dealer in Kelowna,B.C. 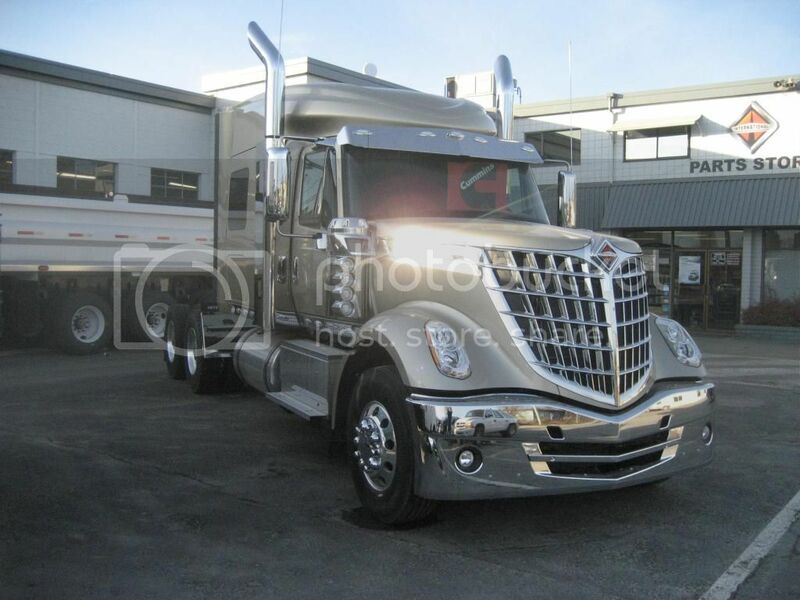 Excellent, Is this NHRS,s New rig as it has a Hummin Cummins under the hood. Bob. Trying to bid, for starring with it in a new Bat-Man movie. Wanted to fit in with the Art-Deco Sci-Fi style, so went with the 37 Ford-on-steroids styling. Couldn't talk them in to installing a "Brownie".....Sorry. That's okay. Rather hang it in there myself, anyway. IHC had the funny habit of putting the selector-box for the "brownie" stick on the LH side of the main-box stick, which would crowd the driver's throttle leg more than I liked, or even worse, further back, between the seats. Doing that myself, I can put it over on the RH side, where God intended. Nice. Just need to take it directly to Diesel Spec to have all the emissions crap removed and then it can actually go to work. Sure wish I could get a glider of one of these to put a C15 in it. Highway spec (12k steer/ 40k drives, 565 ISX, 18-speed, was a "Harley" edition, same bunk as this one) came in at 23,000lbs. empty. Actually had very little fear you'd fall in love with this one. Just didn't seem like she'd be quite your style. Like me, if you wanted a 37 Ford, probably go out & find a real one. Hopefully a 3-window coupe, either dead-on original, or chop & channeled, Hemi with the 6-Pack, Chrome wheels with baby-moons, Borla mufflers, Gear-Venders OD. But, coulda been worse. I'm probably one of the biggest Mopar-fans out here, but what if IHC had copied the old Chrysler Air-flow instead! 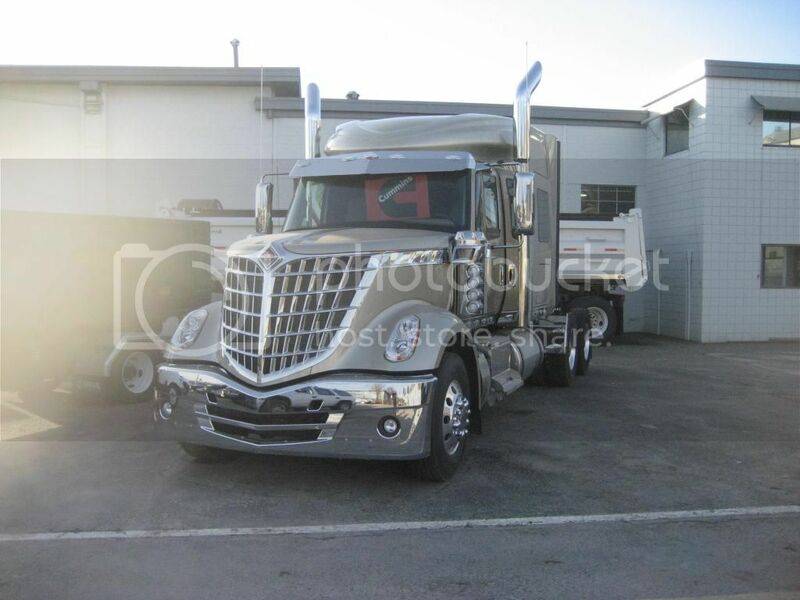 The Lonestar is actually very popular amongst heavy haulers in Canada. They had the most sales in the Canadian market. You see lots of them pulling B trains. I know a couple guys that use them in forestry too and I was surprised to hear they hold up very well going off road. The guys I know with them said they have no squeaks or rattles pounding over the rough roads. I would have though those big plastic grills would have shook themselves apart. To IHC's credit, they must have chosen a real good compound for their plastic, which is probably available for the right price. Mopar went plastic grills on their last-of-the old-style (72-93) pickups. That compound was a sad joke. Have no idea about the later stuff. Do a lot of HO-gauge model railroad "kit-bashing", sawing up, welding styrene back together. It's all over the place for quality. Some is as brittle as an icecycle. Some almost too flexible.